It’s anybody’s guess how ones like 13 Moons slip through the cracks, but in this case it was probably a case of nonexistent marketing and no effort put into a proper release. Despite having a cast that’s speckled with all kinds of big names, character actors and cameos, it has the appearance of barest of bones indie digs, and looks suspiciously like it was filmed bootleg/guerrilla style. I’ve not a clue what the story behind it’s conception is, but it’s a brilliant little flick that you won’t find anywhere these days, but deserves a look. It’s one of those moody, nocturnal L.A. set ensemble pieces in which a group of eclectic characters wander about, intersecting in various subplots until it finally comes together in the third act. This motif is overdone these days, and I just have to throw a jab at Paul Haggis’s Crash, which has aged like Kraft Dinner left for a week in the Florida sun, but my point is that they either work or topple over like a jenga tower buckling under the weight of each character and scenario. This one is so low budget it looks like it was shot on an etch a sketch, but thankfully the story is powerful, emotional, hilarious and strange enough to make a lasting impression. Steve Buscemi and Peter Dinklage are two sad-sack clowns who wander the nightscape, and in fact the image of absurdly out of place clowns roaming the lonely streets of NYC, getting caught up in a raucous night out involving a man (David Proval, an underused talent in the industry) and his young son who is dying of cancer and desperately seeks an organ doner, while his mom (Jennifer Beals) looks for them. Meanwhile there’s an insane clown played by Peter Stormare who’s running about, and when I say insane I do mean it. Stormare is always a little zany and flamboyant, but his work here takes the cake and whips it at the wall. It’s easy for actors to be uninhibited in indie fare like this, free from the prudence of studio chaperones, and he knows this, his character eventually playing a key role but most of the time careening around like a bat out of hell set loose in New York. The cameos are fleeting and fascinating, and one wonders who was buddies with who and pulled what favours to swing their appearances, but it’s nice to see them irregardless. Sam Rockwell and Michael Parks are fun as two bartenders, real life ex-hoodlums Danny Trejo and Edward Bunker show up briefly as.. hoodlums, and watch for quick turns from Pruitt Taylor Vince, Michael Badalucco and others. The film is thoroughly indie that no one has, or probably will ever see it, and my review probably adds to the scant half dozen or so write ups that are out there. Sadly many little treasures like this exist, unbeknownst to most. 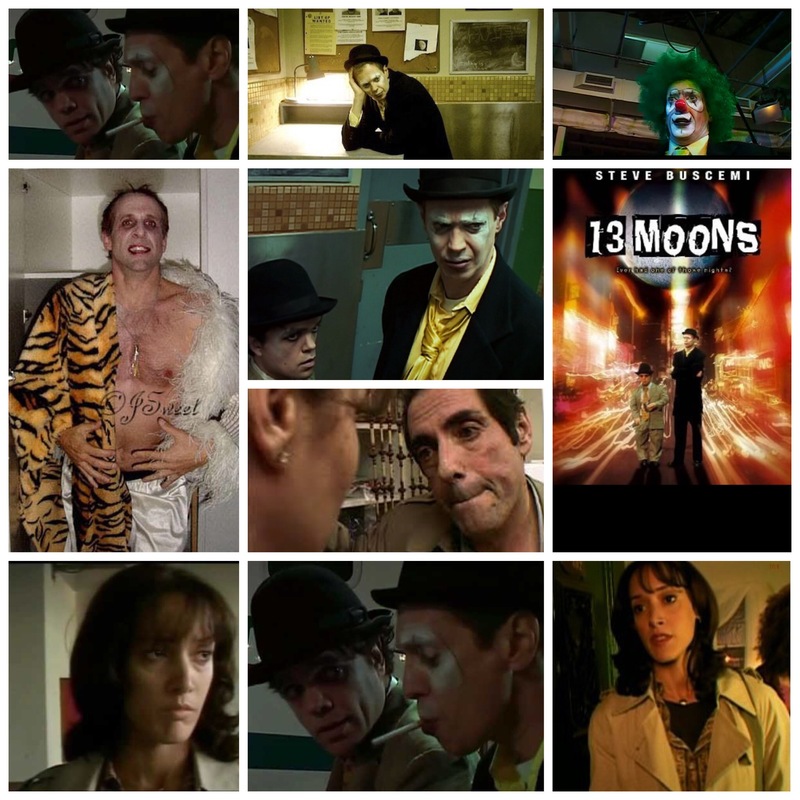 13 Moons is a sweet, scrappy, somewhat star studded little piece that is well worth anyone’s time, if they love a good story in an oddball of a package.